This text is designed to help those who are new to Tibetan Buddhism and taking teachings with a lama. The information found here was taken from khandro.net, berzinarchives.com and elsewhere. A characteristic feature of Vajrayana Buddhism is the requisite ritual for participating in the worship, service and practice of a deity or bodhisattva. This is the process by which a lama with experience in the particular practice confers on others the description, explanation, visualization and order of the practice, along with appropriate offerings and specific mantras. It is more than the sum of its parts though; it is a lineage transmission of blessing and energy. The empowerment or initiation grants permission, bestows help with, and gives access to the benefits of a tantric practice. It can be short or long, and complex or very simple. It normally includes the wang which is the actual consecration or dedication of the student to the practice-deity, the lung , which is the oral transmission -- a recitation of the procedural text or manual and the tri or instructions on how to do the practice. As for empowerment in general, what does the term wang, or empowerment, signify? To begin with, our fundamental nature - what we term 'the buddha nature', the very nature of our mind, is inherently present within us as a natural attribute. This mind of ours, the subject at hand, has been going on throughout beginningless time, and so has the more subtle nature of that mind. On the basis of the continuity of that subtle nature of our mind rests the capacity we have to attain enlightenment. This potential is what we call 'the seed of buddhahood', 'buddha nature', 'the fundamental nature', or tathagatagarbha. We all have this buddha nature, each and every one of us...there dwells within us all this potential which allows us to awaken into buddhahood and attain omniscience. The empowerment process draws that potential out, and allows it to express itself more fully. When an empowerment is conferred on you, it is the nature of your mind - the buddha nature - that provides a basis upon which the empowerment can ripen you. Through the empowerment, you are empowered into the essence of the buddhas of the five families. In particular, you are 'ripened' within that particular family through which it is your personal predisposition to attain buddhahood. So, with these auspicious circumstances established in your mindstream, and when you reflect on what is taking place and maintain the various visualizations, the conditions are right for the essence of the empowerment to awaken within you, as a state of wisdom which is blissful yet empty - a very special state that is the inseparability of basic space and awareness. As you focus your devotion in this way, it allows this special quality of mind, this new capability, as it were, to awaken. Although most practices require an empowerment in order to be able to engage in practice, not all do so. For instance, White Tara, which we practice each Sunday at CRSS does not require an empowerment. Kyabje Kalu Rinpoche, who served for many years as Chief Meditation Master of the Kagyu, in Gently Whispered (New York: Station Hill, 1994) said: "Most tantrayana or vajrarana visualization and mantra practices require that an initiation and subsequent authorization and instruction be given by a qualified lama before the sadhana , or ritual practice, can begin. However, a few practices, those that were given publicly by Lord Buddha Shakyamuni, do not fall under such restrictions. Very definitely, all the practices given in the Sutras have the full blessing of the Buddha and therefore can be practiced if one has the aspiration to do so. Such practices include those of the noble Chenrezig and of the mother of the buddhas, White Tara. Naturally, whenever it is possible for take the vajrayana initiation of Chenrezig or White Tara, you are encouraged to do so... it will deepen your practice and strengthen your connection with your tsaway lama and with [the deity]. The lama will lead the empowerment ritual. Students should generate a relaxed, peaceful, loving mind during the process. During an initiation, try to be alert and aware of what is happening. It is also helpful to make notes of the visualisations and aspects that happen during the ritual. A commentary on the practice may be given or a retreat may be organised after the initiation, also books may be available on how to do the practice. But the lama will give precise details about how to do the practice at the time of the inititation, so it is important to understand these teachings. During any lama visit, it is always possible to request a Refuge Ceremony. The visiting lama may ask if everyone present has taken refuge, especially if the empowerment or initiation ceremony being offered requires it. If this is the case, he will automatically offer a Refuge Ceremony. It is also appropriate to ask Ven. Drupon Rinchen Dorjee to perform a Refuge Ceremony, refuge needs to be requested it is not offered at every teaching. The procedure by which one makes the choice to become a committed Buddhist is known as Taking Refuge. We take shelter in the protection and guidance of The Three Jewels: Buddha, Dharma and Sangha. Many people say that they experience a real sense of relief on the occasion of taking refuge as if they have really come in out of a storm to a place of warmth and comfort. Taking Refuge, then is the first formal step on the Buddhist path. It is conducted as a ceremony during which a person officially becomes a Buddhist. It occurs for most of us as a natural outgrowth of learning about Buddhism and reflecting on what the teachings really mean to us in light of our human condition. It represents our first turning away from our own suffering in the world, and turning toward a genuine spiritual path that can be of benefit not only to ourselves but to others as well. We take refuge in the Buddha by seeing him as the example of the sort of life we should lead in order to unfold our basic goodness and to realize freedom. We take refuge in the Dharma (the teachings of the Buddha and the experiences of truth that accompany them) by seeing them as the path that leads us to freedom. We take refuge in the Sangha, the community of practitioners, by seeing them as our companions who give us direction, feedback, friendship, and support. 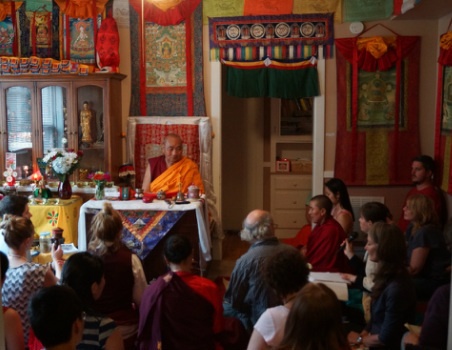 Refuge establishes the proper foundation for receiving teachings on and entering into practices of the Buddhist path. Some people ask if taking refuge vows means converting to Buddhism and leaving forever their native religions. This is not the case, unless we wish to do so. There is no term in Tibetan literally equivalent to a "Buddhist." The word used for a practitioner means "someone who lives within," namely within the boundaries of taking a safe and positive direction in life. Therefore, it is not necessary to give up any religious affiliation to practice Buddhism unless that religion demands actions that contradict Buddhist principles. Khenpo Karthar Rinpoche explains that, "Just because you make a new friend, you don't have to give up your old friend." Also, it is not generally necessary to change one's habits of diet, dress or relations with others, though some people choose to do so. By the way, in many cultures Buddhists are not vegetarian. Formally taking refuge in the presence of a teacher does not imply necessarily committing ourselves to following this teacher as our personal spiritual guide. It is important, of course, always to maintain respect and gratitude toward this person as the one who opened the door to our safe direction in life. Our refuge, however, is in the Triple Gem - represented by a Buddha statue or painting during the ceremony - and not in the specific person who conducts the ritual. Furthermore, regardless of context, our safe direction is that of the Triple Gem in general, not that of a specific lineage or tradition of Buddhism. If the teacher conducting a refuge ceremony or initiation is of a particular lineage, receiving safe direction or empowerment from him or her does not necessarily render us a follower of the same lineage. The Ritual of Refuge: In the presence of a representative of the Buddha' s sangha or community, that is, an ordained Buddhist teacher, priest, monk or nun, the individual asks for admission to the Buddhist community. This is usually in front of a shrine with representations of the Three Jewels on it including a statue of Buddha, and offerings of food, flowers and traditional bowls of water along with incense and an offering of light in the form of a flame. A representation of pleasant sounds, usually represented by a pair of cymbals, is also present on the shrine. The teacher explains that there are requirements. They are: that you are a person who understands what they are doing, that you come of your own free will, and that you promise to observe the precept not to take any life intentionally. The person desiring Refuge kneels in front of the lama. The request is made three different times, each time beginning with an identification of who it is who is asking. That is, your full name. The lama will guide you through this process; there is nothing to memorize beforehand. The lama will then beckon each person to approach, and a tiny lock of hair is cut from the crown of the head. This is a reminder that the ceremony is in the tradition of those who leave everything behind and symbolically experience their own death to become renunciates. The lama will then address you and make a symbolic action of transmission. This is in the tradition of shaktipat ; it marks the moment in time when the change is imparted. This serves also to remind you to think of yourself in a new way from that moment. Finally, you will be given a new name symbolic of your "entering the stream" and will again repeat the formula but now with the identity of a new Buddhist. There will usually be an opportunity at the end, of a day of teaching for the congregation to file up past the lama's chair or lectern for a few words and for blessings. The traditional greeting from you is the presentation of a thin white scarf called a kata. A kata is a sheer white silk scarf used in the Tibetan culture as offerings to people instead of the garland of marigolds or other flowers used in India. Often the teacher will return it by placing it around your shoulders as a form of blessing. Those wishing to make a monetary (or other) offering to the lama can do so at this time. It is usually prepared beforehand by putting it in a white or red envelope. Then when the kata is offered you can place it on the lama's table. Otherwise, you can offer a gift of money to be passed on later by an attendant or sangha member. This offering is, again, in the tradition of Indian guru and student. In ancient times, people desirous of certain precious teachings were put to the test. Along with patience and devotion, generosity is a very important quality in the student. They sometimes donated all that they owned in order to be adopted into the community of a renowned guru. In early days, the donation took the form of a piece of metal work, of gemstones or of food or fuel. Today, money is a more useful offering. Sacred texts & materials should not be placed on the floor and they should not be stepped over by people or by animals. Nothing should be placed on top of these items except for other dharma texts / pictures. Sacred texts include pechas, photocopied prayers, any representation with sacred syllables, dharma books, your personal notes containing dharma teachings, any representation of deities, lamas, buddhas, bodhisattvas, sacred mandalas, etc. If a time comes when the materials are no longer useful, they do not go in the garbage. We burn them and can think of them as an offering at that time. THE SHRINE ROOM Generally help to maintain a respectful atmosphere in the shrine room. Also if you see something that needs to be thrown away or neatened up, please do so. If a lama enters, stand up and offer half-prostration to a lama who is entering, continuing to face him/her as s/he moves through the room. Once the lama has been seated on the throne, you may wish to offer 3 prostrations to the lama and then sit down. If you arrive late, you can still do the prostrations before sitting down. If there is no lama, you may offer 3 prostrations to the shrine before sitting down. PERSONAL OR GROUP INTERIVEWS During many lama visits there will be an opportunity for a short personal interview. You may well want to prepare your questions in advance. The questions should be dharma practice oriented rather than very personal in nature. Tibetan lamas have absolutely no experience at psychotherapy - but they are masters at teaching meditation! Therefore, realize that if you ask questions about your dharma practice you will receive an excellent answer. At beginning or end of an interview, it is customary to make an offering to the lama in your kata (offering scarf) if you have one. This can take the form of money, food item or other items. The katta will be returned to you with a blessing at that time. The lama may touch his/her forehead to yours. DONATIONS TO CHICAGO RATNA SHRI SANGHA ARE MUCH NEEDED AND MUCH APPRECIATED. 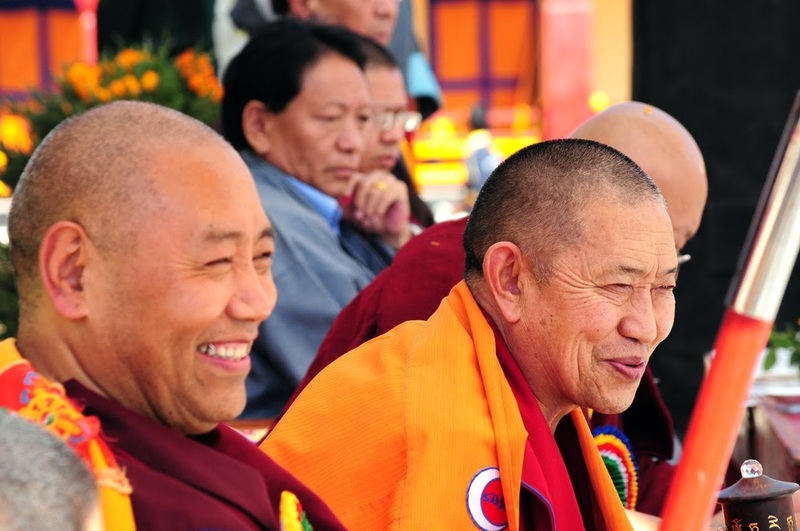 Monks and lamas, our precious teachers, devote their whole lives to the Dharma to benefit beings. Our individual support as sangha members helps make this possible, particularly in the West. Donations are all we have with which to run the center. Money is required for rent & utilities, for transporting visiting lamas here (often with an attendant and a translator), translator fees, producing our newsletter, for mailings, and many other miscellaneous or one-time expenses. Generosity is the first of the six perfections, and Buddhists believe that offerings of money, goods, time, or energy directed toward dharma activities bring enormous benefit to the giver if done with proper motivation. Do not underestimate the value of donating your personal time & energy to the center; these are extremely important & will make a big difference. **PLEASE NOTE: Loving-kindness and Compassion are vastly more important than protocol. Therefore, as you help others along please always keep this in mind.